BioCold Stability Chambers are designed to satisfy demanding environmental testing requirements with exceptional temperature and humidity control, while providing reliable and efficient solutions for a variety of stability testing applications. BioCold stability chambers are built around an Allen Bradley programmable logic controller (PLC), providing customers with remote access Ethernet and serial monitoring and control. All control and monitoring functions are accomplished through the BioCold control system, including optional programmable temperature, humidity and lighting routines. BioCold stability chambers use a continuous solid state cooling system with low watt density heaters, eliminating downtime due to refrigerant leaks or compressor failure. Solid state thermoelectric cooling systems offer an average life of 23 years of reliable, efficient operation. By cycling resistive heaters against a constant cooling load, BioCold offers tight temperature control (±0.2°C) over a range from +25°C to +40°C, with extended ranges available. BioCold’s ultrasonic humidification system provides efficiency and precision in humidity control. The chamber cooling system provides a constant dehumidification effect, with the humidifier injecting water vapor instantaneously into the chamber at less than 10% the energy usage of traditional steam generators. Desiccant dehumidification systems are also available for low humidity applications. Double-wallcabinet construction with foamed-in-place high density urethane insulation (CFC-free) provides years of trouble-free operation. Chambers come standard with a stainless steel door, brushed anodized aluminum exterior, NSF-approved aluminum interior, and stainless steel floor. Chambers are also available in optional stainless steel interior and exterior finishes. Chambers are equipped with heavy-duty, vinyl-coated wire shelving able to support up to 200 lbs. of distributed load per shelf. Chambers come standard with three shelves per door section, with additional shelving available up to a maximum of six shelves per door section. 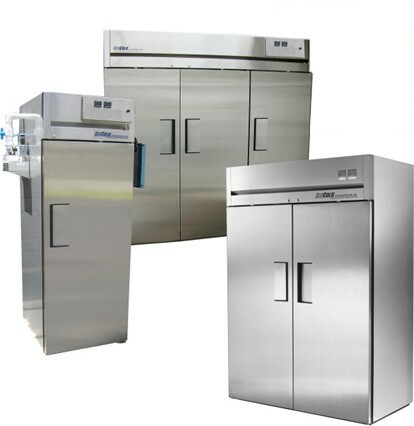 BioCold offers a wide range of options and accessories. Please contact us or call (636) 349-0300 for any features not shown.